Isn’t it amazing how well the human mind is able to isolate and remove what he does and does not want to process. How powerful is our brain and how strong is our heart when we do that? This can only be the power of Allah who is the controller of hearts. Sometimes in life we have to teach our hearts to learn to accept rejection ….but not just any rejection, we mean the type of rejection we experience in our limited life when we don’t recieve what we have been making duah (supplication) for. As I look back on my life, I realize that every time I thought I was being rejected from something good; I was actually being redirected to something better. You must convince your heart that whatever Allah has decreed is most appropriate and most beneficial to you. This year we experienced the longest summer Britain could possibly have…and yet we still were not prepared for the cold that was not far in reaching us. Winter is here people and yes amidst all the depressing things that can be said about winter….it actually has quite a lot of benefits for the believers and those who are good at making use of their time wisely. Firstly, the days are shorter, and although that means all the prayers are so near to one another, it also means if you look on the bright side you could keep one wudhu (ablution) for all your prayers. Secondly, for those who have fasts to make up could do so easily in the winter as people have only a few hours of fasting to look forward to. And thirdly, because the days are shorter and nights are longer, there isn’t a better time of the year to start getting up for tahajjud (night prayer). 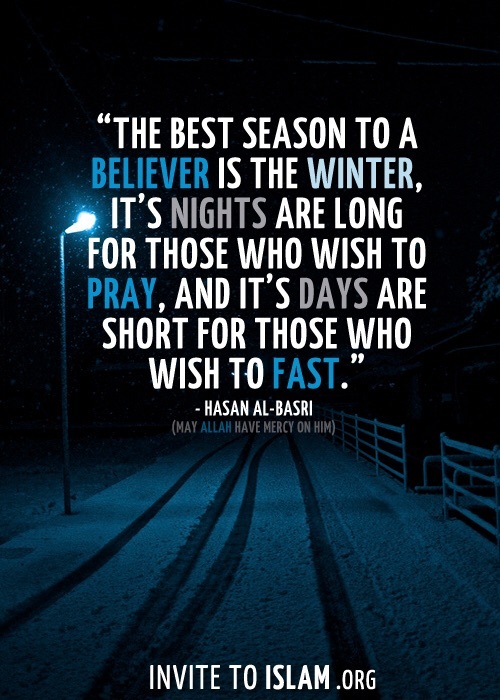 Even if you only make up one tahajjud in the whole of winter is better than no tahajjud during the year. Subhanallah isn’t just amazing when Shaytaan makes one believes that his sins are too great for Allah to forgive, or he says well im gonna sin again so why shall I be playing about with forgiveness…sin…forgiveness…sin…but hold on dearest brother/sister, that’s exactly what Allah wants you to do He wants you to ask Him..He is happy when you ask and angry when you don’t. Seek Him for He is the only one who can relieve you from your isery…don’t fall for shaytaans plot that your sins are too great. 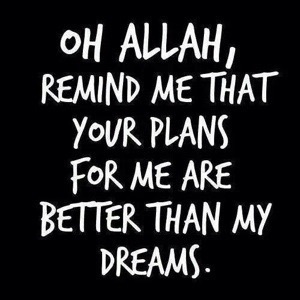 Allah’s Mercy is far greater. 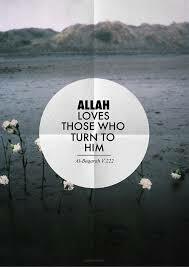 Walk to Allah and He will run to you. Make that first change and start making Istighfar. Iftar Pack Certificate – Thank You All! 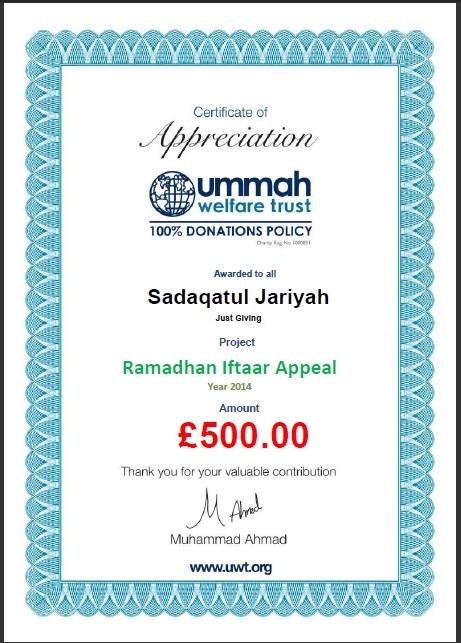 Alhamdulillah Ummah Welfare Trust have awarded Sadaqatuljariyah Blog and all its Donors for the Ramadan Iftaar Pack that we collected during Ramadan 2014. A BIG jazakallahu Khayran to everyone.